The approach to the crag is about a one mile. Some of the easiest routes in the Tahoe region (5.6) are here at Emerald Bay, but there are also more challenging climbs, making this wall fun for everyone. Most people spend anywhere from 1-6 hours playing around at the crag. Winter runs the risk of snow, but shoulder seasons and summer are ideal. 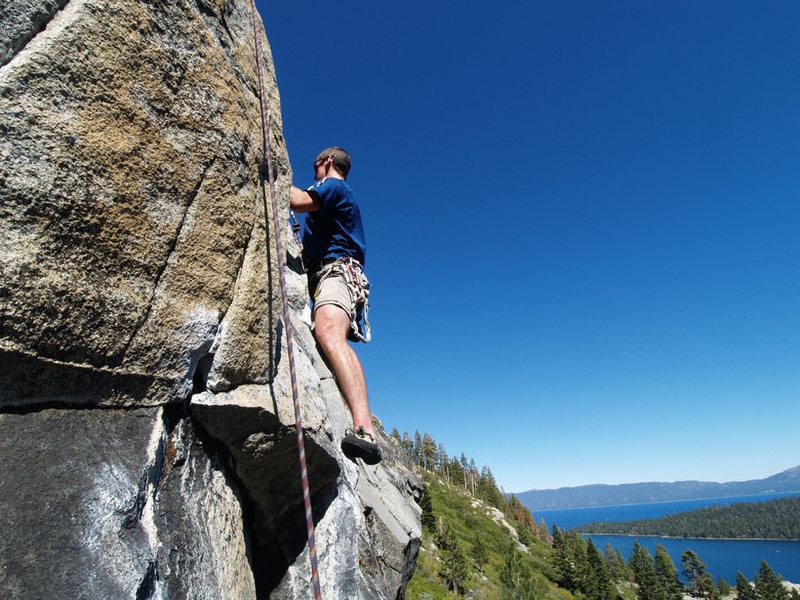 Epic vistas and ease of access make this beginning to intermediate rock climbing sport ideal for anyone looking to take in the true Tahoe experience. It can get crowded during the height of the summer season, but if you time it right with tourist traffic you will be glad you didn’t skip it for a more remote climb. Emerald Bay might be one of the most visited areas around Lake Tahoe, but one look at the magnificent views and large granite slopes and it’s clear to see why this part of the lake draws so many people. 90 Foot Wall is a well loved sport climbing destination that boasts excellent beginner and intermediate routes as well as an awesome vista. Most climbers who stop at this spot set up a top rope by hiking up the far western side of the cliff, securing an anchor, and dropping their rope over. Because these anchors do see so much use, it wouldn’t hurt to back them up. Routes include a 5.6, Holdless Horror, and a 5.10c, Alias Emil Bart. There are several fun cracks and chunkier holds that make this wall fun for everyone. The approach to 90 Foot Wall is short and sweet. Park at the Eagle Falls Trailhead and stay towards the right when the trail splits. Continue straight past a bench and lookout point for about 150 more feet until you reach the wall. If crowds get you down, stay clear of 90 foot wall during busier weekends in Tahoe. If you are able to avoid the masses, however, this wall is fun for everyone. It is especially great for groups of mixed skill level because beginners and more advanced climbers can scale the wall right next to each other or even belay each other on their respective projects. Those who aren’t fans of lead climbing will also like being able to set up their rope without have to worry about taking a fall. There is no charge for parking, but make sure you get there early enough on a busy weekend to snag a parking spot. The parking area is right off of Highway 89/Emerald Bay Road just under 12 miles from South Lake Tahoe.